If you're familiar at all with East Boston or South Boston, then you know that the parking situation is unbearable. It's nearly impossible to park anywhere convenient to where you need to be--whether that's your home, your work, or just going out on the town. If you're tired of commuting into those neighborhoods only to be faced with astronomical parking garage fees and non-existent on-street parking, we're here to tell you that there's a better way. Why not buy a condo in a new construction building? You get your own parking space guaranteed, and many of these new high-rises are within walking distance to the major hubs or at least have access to T stations, highways, and other transportation outlets. South Boston Transportation Center, currently under construction in the Seaport, will provide 1,500 new parking spots to help accommodate/alleviate the lack of parking in South Boston and Seaport. Buildings such as 14 West Broadway offer 24-hour valet services (in addition to underground parking spaces) to accommodate lack of parking. This luxury condo building is 11 stories tall with 47 units. Port 45 on 45 West Third Street offers one parking spot per unit. It features five stories and 105 units, with 109 garage parking spaces for residents. 150 West Broadway offers one parking spot per unit, and two parking spots for each penthouse unit. This five-story condo building will feature 30 luxury condos and 33 on-site parking spaces. Similarly, developers in East Boston are also accommodating parking spots in new construction buildings. Slip65 at Clippership Wharf, slated for completion in late 2018, as well as 151 Liverpool Street, both offer one parking spot per unit. The six-story Slip 65 at Clippership Wharf, spanning 12 acres, will feature 300 garage parking spots for residents and 20 available for public use. 151 Liverpool, also six stories, will have 36 condos and corresponding parking spots. The squeeze for parking has only been getting worse as more people clog the city streets of East Boston and South Boston. The problem is compounded in winter when the snowbanks take away more of the precious parking spots that people rely on to park at home or work. Just how many parking spaces are left in these neighborhood is anyone's guess. That's because Boston has stopped keeping track. The Massachusetts Port Authority estimated back in 2012 that there were 6,000 spaces in surface parking lots in South Boston, particularly in the Seaport District. It projected that in 2015, there would be only 750, according to the Boston Globe. Currently, no one is really sure how many there are now. 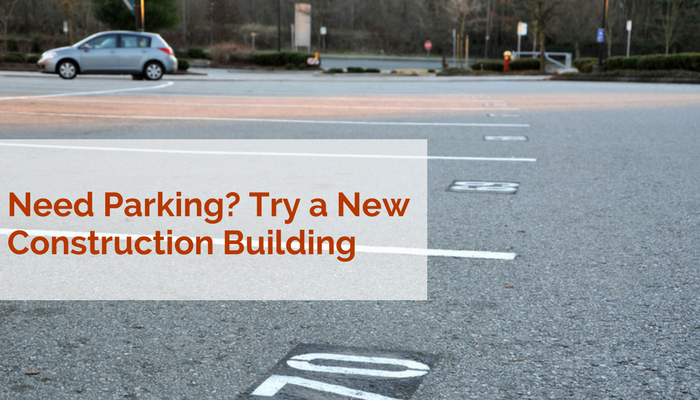 How would you like to never have to worry about parking again? Call us to learn about any of the above new construction buildings in East Boston and South Boston. We're located at 174 Dorchester Street in Boston, MA 02127. Get in touch at 617-701-6300 or email us at info@elevatedboston.com. We would be happy to show any property to you. Just give us a call and book an appointment.